London itself covers 700 square miles but the City of London, otherwise known as The Square Mile, is the area that is administered by the Corporation of The City of London. With its formation dating back to medieval times The City of London is Britain’s oldest local authority. The parliament at Westminster is based on The City’s Court of Common Council and has been called the ‘grandmother of parliament’ ! There were no permanent settlements in the area, now covered by the City of London, when the Romans arrived in 43AD. The area was marshy and The Thames had a number of sand or gravel islands in it. In fact it was probably the existence of these islands that made it easy for the Romans to construct the first river bridge slightly to the east of where London Bridge stands today. Within twenty years Boudicca, queen of the Iceni tribe (present-day East Anglia), attacked the settlement and destroyed a large proportion of it. The Romans responded by the construction of a much more substantial settlement and by 200AD they had built a six metre wall and ditch (or moat) around what became The City of London, enclosing just over half a square mile. Within the wall they built a cluster of timber-framed wooden buildings surrounding the imposing Roman civic buildings. Roman ‘Londinium’ had the largest basilica (town hall) west of the Alps, a governor's palace, a temple, bathhouses and a large fort for the city garrison. Traces of the wall can still be seen in a few places in London. London continued its growth under the late Roman Empire, and at its peak the population probably numbered about 45,000. This compares to a resident population of just 8,000 today with approximately 32,000 people working in the city during the day. The City expanded to 1.01 square miles and included parts of Southwark, on the south side of the Thames. Later changes in 1899 saw the lands south of the river being lost by The City and more boundary changes in 1994 saw The City we see today with an area or 1.2 square miles. The Romans initially created five gates in the wall. Clockwise from the west they were Ludgate, Newgate, Cripplegate, Bishopsgate and Aldgate. They added Aldersgate, midway between Ludgate and Cripplegate, in 350AD. 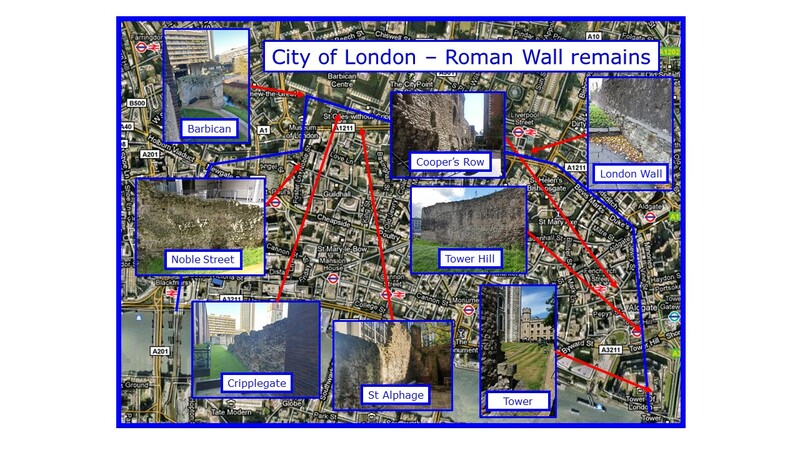 The Romans left in 410 AD but their constructions defined the city of London for the next millennium. It is interesting to note that the Romans were in London for a longer period than that which passed between Queen Elizabeth I and Queen Elizabeth II. In the fifteenth century the wall was restored and an additional gate was added at Moorgate. All the gates were repaired and restored many times over the centuries until around 1760 when they were demolished to improve the flow of traffic ! The current City of London is slightly larger than the original Roman walled city. A 12th century visitor to the City of London would have seen a city of steeples and by 1183 there were believed to be 13 monastic and 111 parish churches with the city. This equated to one church every three acres each with a minimum of 300 parishioners. The oldest church, in the City of London, is believed to be All Hallows-by-the-Tower which was originally founded in 675 AD by the Saxon Abbey of Barking. The map below shows the distribution of the 97 parish churches which were included in the plague records of 1665. Each London parish reported the number of deaths due to the plague. The disease had been around for centuries and reached a climax, especially in London, in September 1665. 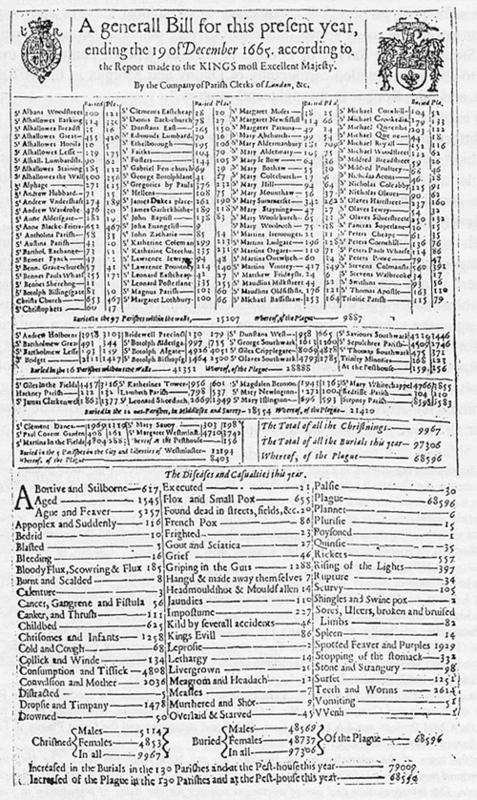 The Mortality Bill was published at the end of 1665 and summarised the reports from each London parish. The Great Fire of London burned from Sunday September 2nd to Wednesday September 5th in 1666. It is believed to have started at a baker’s in Pudding Lane, just to the north east of London Bridge. The fire destroyed much of the old medieval city within the Roman Wall. Over 13,200 houses, which were home to over 70,000 people, were lost. In total, 82 of the city’s parish churches were also destroyed as well as Saint Paul’s Cathedral. The toll in human terms, however, was on a much lesser scale and as few as fifteen deaths were recorded at the time. After the fire King Charles II set up a commission to plan the reconstruction of the city. Sir Christopher Wren was employed to design and oversee the reconstruction of Saint Paul's cathedral and the damaged parish churches. The commission, led by Wren, decided that 34 of the churches which had been destroyed were redundant and would not be rebuilt. Saint Paul's Cathedral and the remaining 54 parish churches were replaced by Sir Christopher Wren and his team over the following years. If you click on the map below you will find more links to information about the churches which were not rebuilt after the fire. During the eighteenth and nineteenth centuries the population of the City of London dropped significantly as people moved out into the ever expanding suburbs. This resulted in a need for fewer parishes and the demolition of the associated churches, under the terms of the Union of Beneficiaries Act of 1860. Some churches were also demolished due to the pressures for expansion in the city, including the expansion of the Bank of England and the widening of London Bridge. Additionally others were removed as they were deemed unsafe. In total 16 churches were demolished during this period. If you click on the map below you will find more links to information about the churches demolished during the late eighteenth and nineteenth centuries. During the period between 7th September 1940 and 10th May 1941 The City London was bombed by the German Luftwaffe. All except four of the churches in the city were damaged in one way or another and a number were destroyed. Saint Paul’s Cathedral was spared and the majority of the other damaged churches were rebuilt to their original design after the war. If you click on the map below you will find more links to information about the eight parish churches which disappeared completely during the twentieth century. Today 29 of the original churches, plus Saint Paul's Cathedral, still stand within the old Roman wall. In addition two churches remain as ruins and eight are only represented by their original towers. If you click on the map or pictures below you will find more links to information about these surviving churches. Please contact me here if you would like details of a walking tour - with an optional free guide - to visit these, and many more wonderful & interesting buildings within the old Roman City Wall. The 'circular' walk is 8.8 kilometres (5.5 miles) in length and walking at a steady pace will take just over three hours if you do not stop to explore the wonders of the City of London Churches. With thanks to The City of London Corporation and Google for maps and Wikipedia for general information.